These donuts are so simple, and so fun - a great activity to make with the kids this weekend. 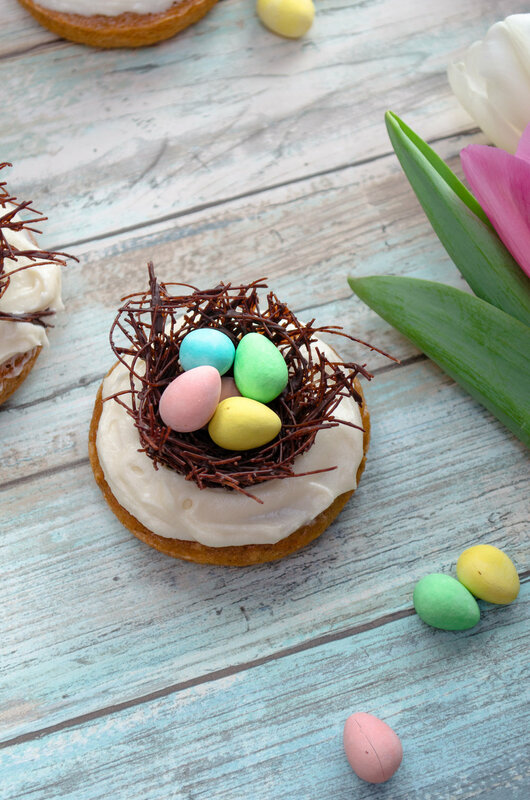 A simple baked carrot donut, topped with cream cheese icing and adorable (edible!) chocolate nests filled with mini-eggs. Happy Easter! Preheat the oven to 350 degrees. Butter or spray donut baking pan. Using a stand mixer or beaters, cream together the eggs, brown sugar and vanilla. Add the sour cream and mix again until combined. Add the carrots and spices, and mix again until well combined. Set aside. the batter into the donut pan. Bake at 350 degrees for 10 minutes or until a toothpick comes out clean. 1. Using a stand mixer or electric beaters, whip together the cream cheese, butter and vanilla. 2. In batches, add the icing sugar until desired taste is reached. Continue to whip the frosting on medium speed for at least 3 minutes. In a microwave safe bowl, melt the chocolate in 20 second increments, stirring between each increment. Cut up the vermicelli noodles into 3-5 inch pieces. Pour the melted chocolate over and use your hands (I recommend gloves) work the chocolate into the noodles until they are all covered. Once the donuts have cooled completely, generously apply the frosting to the donuts. Gently pop the bird nests out of the ramekins and place in the centre of the donut. Fill the nest with 3-5 candy coated chocolate eggs.